Yet another last-minute menu plan. 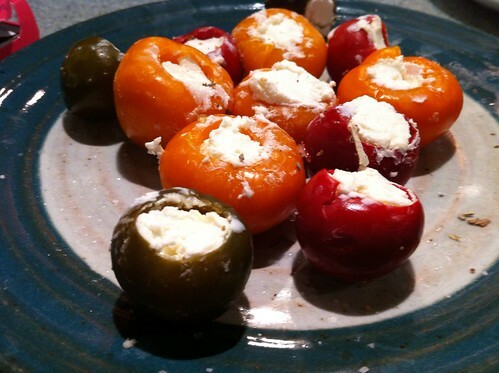 Earlier in the week, I asked a mutual friend if he had tried peppadew peppers stuffed with goat cheese. He had not. I thought I'd make some quickly -- I dusted them with some savory sage salt. The previous week, I had planned a meal that the power company decided to interrupt. Thankfully you and G were flexible and instead we had a nice meal out. 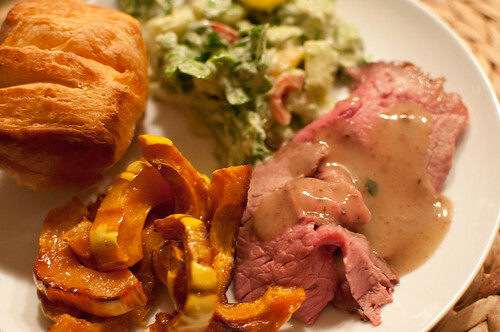 From the interrupted menu, I decided I would make roasted delicata squash but I switched up the rest of the menu. For some reason I wanted to make roast beef. Why? I have no idea. 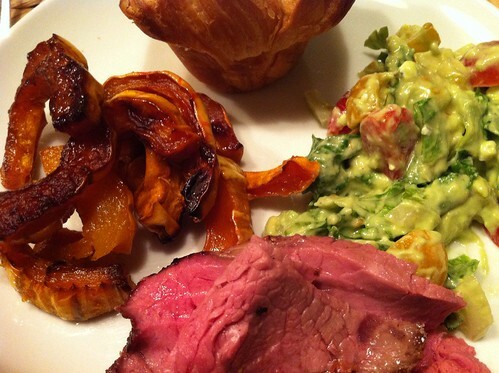 Loosely following this recipe, which had me cook the roast on a rack in the center of the oven, so that it could cook from all sides at once. It starts at a high heat to crust the outside, then the temperature is dropped and it finishes cooking. N's mom makes a chopped salad that I love. I have tried to copy it many times to no avail. This weekend, N called her to ask for her recipe. The secret? She blends blue cheese with ranch dressing and avocados for the dressing. Aha! It looked like a lot of dressing but it was mostly avocados! 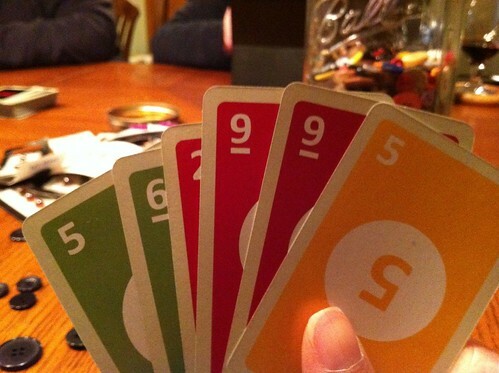 I had pulled out Agricola, but N wasn't feeling up for it so he dealt our new Uno deck. It was labelled Uno Mod, which I thought was just a reference to the new deck design. Oh no. There is actually a new CARD. This new card allows the player to play it and hand out cards of the color selected to all of the other players. I don't think we liked it much! Why mess with success? After G beat us in Uno, we played a bit of Carcassonne. It was a close game. I've been playing a lot of Carcassonne on my phone. 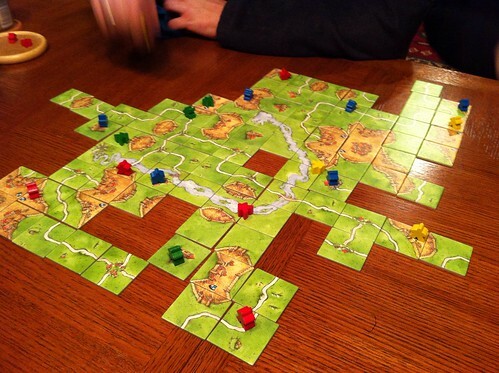 Maybe it's helping -- the rest of you usually destroy me in Carcassonne.